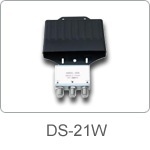 This DiSEqC 2 x 1 switch can help you receive digital and analog satellite from 2 universal LNBs. As usual, the polarization and bands are switched by 14V / 18V and 22 KHz. Then the Satellite A / Satellite B (SA/SB) DiSEqC command is used to select one signal. It also supports mini DiSEqC commands so you can use " Simple Tone Burst" to control it without a full DiSEqC receiver. 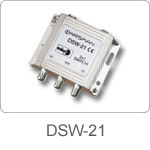 •This device supports up to DiSEqC v2.0 which means that any DiSEqC receiver of earlier DiSEqC versions will also operate correctly with this device. 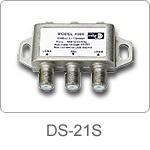 •DiSEqC = Digital Satellite Equipment Control. •'DiSEqC' is a trademark of EUTELSAT. •EUTELSAT = European Telecommunications Satellite Organization.